Golden Bay is a unique place and ideally suited for an enjoyable tour of open fine art studios. The area is little more than an hour’s drive from one end of the gentle curve of the Bay to the other. The weather is generally warm and comfortable, sheltered by the mountains of the Kuhurangi National Park to the south, the bush covered hills of Abel Tasman Park to the east and the sweeping curve of Farewell Spit to the north. The arts community is vibrant and varied, catering to all tastes and expressions. The Golden Bay Arts Trail brings together eight open professional studios and their resident artists. You are invited to tour the region and experience this opportunity to enjoy the art and its regional context, we welcome you here. On the edge of the lagoon at the eastern end of Ligar Bay in Golden Bay is the studio and gallery of Johanna Ward. Johanna loves to have visitors and welcomes you to come and see her latest work. Johanna has her own personal style and creates intensely colourful works in oils on board or canvas. 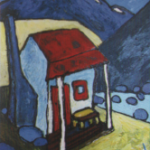 Her work is inspired by New Zealand land and seascapes and familiar interior scenes which all receive Johanna’s perspective, vivid colour and exaggeration that capture the essence of the scene. 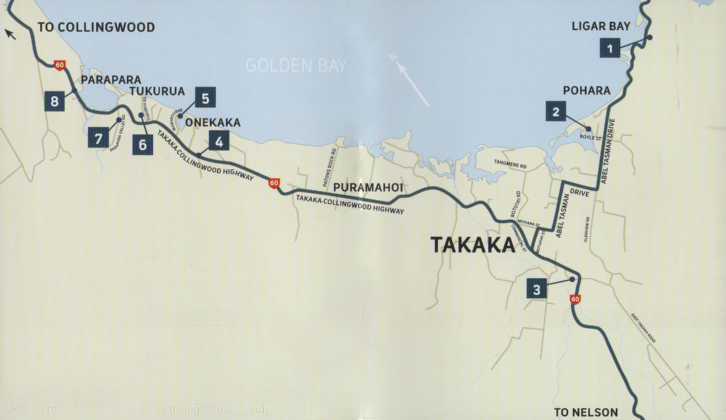 Take the road from Takaka to Pohara and continue through Pohara until you reach Ligar Bay. Surrounded by native gardens overlooking Motupipi Estuary, EarthSea Gallery is the studio and gallery of landscape painter Peter Geen. 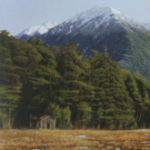 While Peter is a regionalist painter, finding and inspiration in Abel Tasman and Kahurangi National Parks and Farewell Spit, he also enjoys capturing the wilderness of the southern mountains of New Zealand. Feel free to linger in Peter’s gallery and absorb the perfection and ambiance of his paintings and fine art giclee paints. On the road from Takaka to Pohara turn left into Boyle street at Clifton. EarthSea Gallery’s sign is 1km on the right. Nestled in a cottage garden setting only 2.5 kms from Takaka if where you will find Indigo in her studio/gallery creating her next painting. She welcomes you to view her work. Indigo captures her love of nature in a variety of styles ranging from delicate detialed ink and wash studies through to bold abstract acrylics. Be sure to drop in and have a look when you are passing. Take the road from Takaka to Nelson, SH60, and only 1.5kms from Takaka turn right into Dodson Road. Sign out front. Gallery Opening Hours, Summer Fri-Sun 10am-4pm. After hours and Winter by appointment. A unique opportunity to experience three artisans creating original high-quality jewellery in the heart of beautiful Golden Bay. 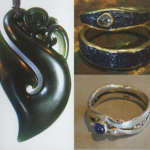 Geoff Williams is a jade carver who creates individual hand-carved pieces from genuine NZ jade, paua and semi-precious gemstones using traditionally and locally inspired designs. Specializing in local and recycled gold…Grant Muir creates wedding and engagement rings…handmade one-off designs…yours or his…using diamonds and other precious gems. 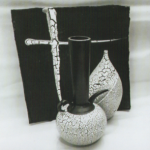 Peter Meares is a silversmith who makes intricate and detailed pieces with precious metals and precious metal and precious stones for precious memories. Gallery Opening Hours, Summer daily. Winter variable. 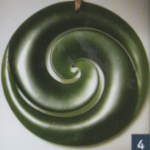 Rozi Demant lives and works on the shores of the beautiful Onekaka estuary. In this idyllic setting she sculpts in stone, stylized female faces and forms that express the essence of womanhood, projecting the varying emotions of melancholy through to contentment. 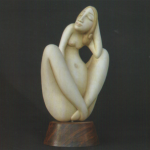 Figures that are both voluptuous and slender, faces that are feminine and slighty masculine create a beauty that will captivate and stimulate thought. Small Hurunui stone interior sculptures to large Oamaru garden sculptures, all painted and shaded in Rozi’s distinctive style. Gallery Opening Hours, Summer 10am – 5pm. Winter by appointment. Paul specializes in high quality tablewares for everyday enjoyment from a favourite mug to stunning dinner sets. He also loves to make unique display pieces with dramatic glazes. 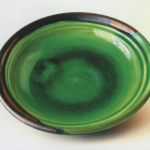 Paul is known for his large platters and bowls, however there are smaller pieces on offer too. Paul is a highly reqarded teacher and holds a week long intensive workshop yearly. 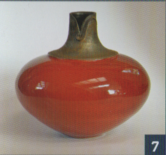 Paul Bauer uses clay, water and fire to create unique award winning pottery with impressive glazes. Hans fins inspiration in his tranquil surroundings and the colours and textures of his claywork reflect the influence of beautiful Golden Bay. 18kms on State Highway 60 from Takaka towards Collingwood, turn left into Parapara Vallet Road. Follow signs to gallery 1km from main road. 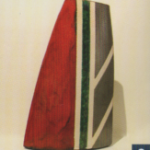 Rosie Little and Bruce Hamlin established Estuary Arts in 1987. 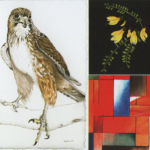 Together they produce klin-formed glass, sculpural ceramics, tiles, acrylic and water colour paintings. They have exhibitied widely. 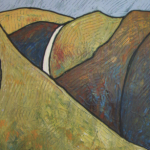 Their bold, dramatic work reflects local and New Zealand themes. 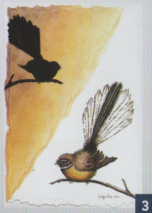 Artwork is couriered and insured throughout New Zealand and worldwide. 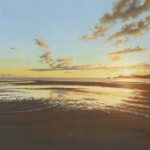 25kms from Takaka on State Highway 60, look for the Estuary Arts metal sign at roadside entrance on the northern side of Parapara Inlet. 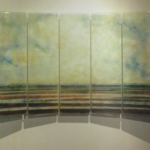 Estuary arts also have a showroom in Collingwood.